I went to visit one the other day and I felt like a total vulture wandering the aisles. Everything's on sale - although, true to form for Borders, "sale" just means comparable to regular prices at other stores (especially true for their media section). Truth be told, right now, everything's only at 20% during this going-broke sale, and there are sure to be steeper discounts in a week or so. Of course, that didn't stop me from spending way too much on stuff that I don't really need, or need right now. Totally stocked up on pretty notebooks and pretty pens and gift wrap. In fact, I really only bought two books, and they weren't even romance books. I bought this magnet from Borders, too. I couldn't resist - especially because not a day or two before, I sorted through my hidden-away collection of genuine vintage 80s earrings and brooches. They're below, because I'm now trying to figure out if I should sell them - as a lot, or individually, or if I should save 'em for yet another decade. I haven't a clue what I was thinking when I got those parrots in the bottom left corner. I won't lie, I don't remember wearing them. 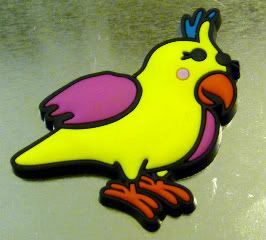 i remember you wearing the parrots. and i probably laughed. you ALWAYS had weird earrings.